An exciting part time opportunity has arisen at The Royal Shrewsbury Hospital for an Optometrist with Specialist interest in Corneal and Adult Contact Lens treatment. The successful candidate will join the Ophthalmology team in providing ophthalmic care in the Adult Contact Lens clinic based at the newly built Eye Department. The role offers the opportunity to work in a Lead role alongside Ophthalmologists and specialised nurses and allowing you to develop your professional skills and make management decisions. Previous experience of working in a hospital setting in an extended role would be advantageous. You must be a qualified Optometrist with evidence of additional specialist knowledge through training or study regarding the specialised contact lens assessment and fitting. The Trust has recently undergone an £800,000 major redevelopment of the Ophthalmology outpatient department which has transformed the department. The department provides services for over 560,000 patients spread over the large County of Shropshire, encompassing Shropshire and Wales. You will be working alongside a friendly, expert and energetic team of Consultants, Speciality Doctors, Junior Trainee Doctors, Orthoptists, Diabetic Eye Screening, Specialist Nurses and Technicians. The whole department is overseen by the Centre Manager and Clinical Director for Ophthalmology. Our Hospitals are located in Shrewsbury and Telford and are brimming with exemplary teams of hard working individuals. We have successfully secured more than £300m of investment from the Government for the reconfiguration of our two hospitals. This paves the way for the NHS Future Fit programme to go out to public consultation. NHS Future Fit proposes that one hospital provides emergency care services (including women and children’s inpatient services) and the other hospital provides planned care services. Both hospitals would have an Urgent Care Centre that is open 24-hours a day, seven days a week. The proposed model of hospital care has been designed by members of the public and over 300 clinicians, GPs and social care professionals. Whichever option is approved, NHS Future Fit’s proposed model will ensure a wide range of hospital services will still be available at both hospital sites and, importantly, stay within the county. 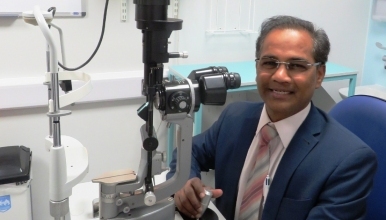 We want you to find out more about the department and our hospitals, and we invite you to contact Mr Prasad Rao, Clinical Director for Ophthalmology with any questions you may have on 01743 261496, or even arrange a visit. Please also take the time to read the supporting documentation to really get to know us.